Dubai is a great place to go on a honeymoon regardless of your budget. With tranquil beaches and desert sunsets setting the scene, paired with sumptuous hotel suites and romantic meals in world-class restaurants, Dubai makes for a great honeymoon destination regardless of your budget. Here we give you the lowdown on all you need to know to organize your Dubai honeymoon! Dubai’s high season runs from November until April, when temperatures are warm but not overbearing and the chance of rain is slim. Although this means you’ll face higher accommodation rates, this time of year is ideal for honeymooners looking to explore the city together before opting for one of the Emirates' many outdoor activities or heading to one of the beaches. On either side of the high season, May, September and October are also good times for those honeymooners looking for a beach-focused getaway, since the sea has warmed up, but air temperatures remain at a tolerable average of 29°C. June, July and August are Dubai’s summer months. Though you’ll find plenty of bargains when it comes to accommodation, the Emirates gets so hot you won’t be able to do much other than move from one air-conditioned building to another. But this makes it perfect for those couples eager to explore Dubai’s malls. Check out our travel guide on the Best Time to Visit Dubai for more info. 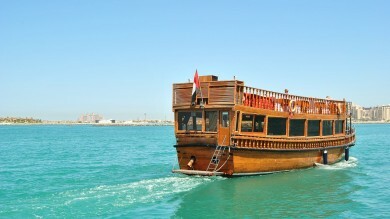 A dhow cruise allows you to enjoy a scenic cruise through Dubai. A gentle cruise on a traditional wooden dhow along the historic Dubai Creek or the modern Dubai Marina is a wonderfully romantic way to start exploring Dubai. Easy to book, many cruises come with a buffet dinner of international cuisine with a traditional dance performance that lasts approximately two hours. Read this Ultimate Guide to Dhow Cruise in Dubai to learn which cruise will suit you best. 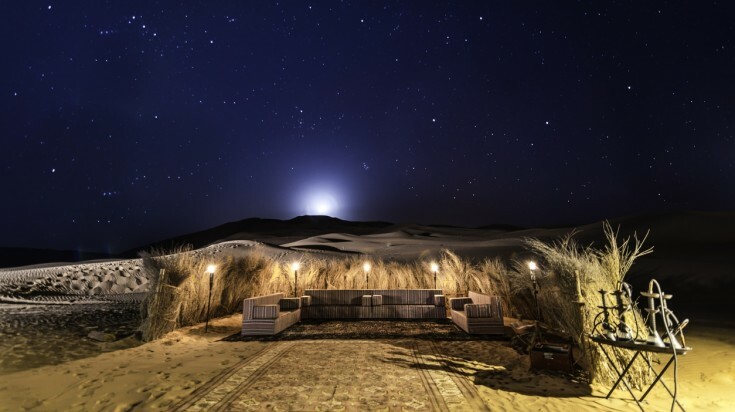 Spend a night together under the stars in the Arabian desert. 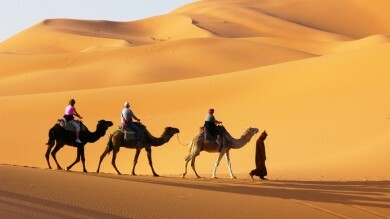 The desert is one of the top places to visit in Dubai for a honeymoon. After crashing through the desert sands on a dune buggy or all-terrain vehicle, change gears by staying overnight in a lavishly-prepared and decorated tent enjoying traditional Bedouin food and hospitality. The starlit night sky and majesty of the desert will make you feel like the only couple alive. Check out this travel guide on Desert Safari in Dubai to find out whether to go for a morning desert safari or an evening desert safari. Soar on a hot air balloon over the Arabian desert. You’ve sailed Dubai Creek and cruised the desert, why not float silently above Dubai’s landscapes as dawn breaks on a new life together too? Opt for a package that includes a glass of champagne to make the experience all the more special as you look down upon the sand sea, dotted with green oases and solitary animals such as oryx and camel. And if getting up before sunrise doesn’t sound like your kind of thing, sunset balloon rides are also available. 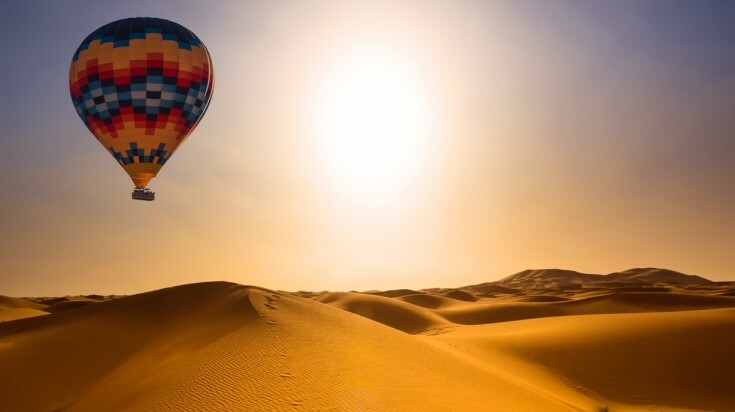 Get on a hot air balloon and discover the Arabian desert with this tour. Make the most of Dubai's best restaurants by going on a romantic dinner. Dubai is best known for it's culinary experiences with restaurants serving international cuisines like Chinese, French, Indian and Japanese as well as traditional Middle Eastern dishes. Not only that, this ultra modern destination also gives couples an opportunity to experience dining in the most exotic ways, whether it's underwater dining or up in the tallest buildings of the world. Visit Miracle Garden for a romantic afternoon stroll. Fittingly opened on Valentine’s Day in 2013, Miracle Garden is the largest natural flower garden in the world, stretching over 72,000 square meters. Home to 45 million flowers and 250 million plants, the garden contains a passage of hearts and monumental flower displays such as a full-sized castle, giant teddy, and even a flower Emirates aircraft! It is nothing like other gardens you may have visited as a couple around the world. Enjoy a day in Miracle Gardens with this private day tour. Take a stroll on the beaches of Dubai. One of the best things to do in Dubai for honeymooners is to simply stroll hand-in-hand on the pristine, clean, white-sand beaches of Dubai. Many beaches are part of the shoreline hotels but there are public beaches that can be visited free of cost. Kite Beach is a great place for water sports lovers, Sunset Beach offers a spectacular view of Burj Al-Arab and the beach by Jumeirah Beach Residences is lined with restaurants and fashionable boutiques. Located adjacent to Burj Khalifa and the Dubai Mall, this hotel is perfect for couples that are on a budget. Rove Downtown provides comfortable and cosy rooms, with easy access to public transport and nearby locations for shopping. The hotel also has an inhouse 46-seater cinema where you can sit back and enjoy movie screenings. Price: Starting from USD 130* per room per night. The DAMAC Maison is located in central Downtown area of Dubai in close proximity to the Dubai Mall. It provides spectacular views of the city and rooms are chic and comfortable. The hotel’s central location means that it is easy to access Dubai’s attractions such as Burj Khalifa and Dubai Creek. The hotel also offers free shuttle service to Dubai Mall. Price: Starting from USD 160* per room per night. Situated on a popular stretch of The Walk on Jumeirah Beach, Amwaj Rotana provides spectacular views across the Arabian Gulf. Private balconies enable couples of enjoy sunsets in peace and privacy, while also offering the chance of romantic meals in its restaurant. Location: The Walk, Jumeirah Beach, Dubai Marina. Price: Starting from USD 250* per room per night. Located on the Palm Jumeirah’s outer crescent road, the Jumeirah Zabeel Saray is not as well-known as the iconic Atlantis hotel, but offers an incredible grand imperial suite for those for whom money is no object. The 310 square meter suite includes its own butler service, sauna, and sea views that span its entire length. Price: Starting from USD 370 per night, with the grand imperial suite costing from USD 1400* per night. Named for its downtown location, the Palace Downtown is right at the heart of this thriving city, with views of the Dubai Fountain that are particularly romantic come the lights of nightfall. Whatever your food tastes, there is a range of cuisines to choose from too, from Southeast Asian curries, to South American barbeque. The first and perhaps most famous of the Palm Jumeirah’s phenomenal hotels, Atlantis has everything a honeymooning couple could ask for, from top quality service to world-class eating right on your doorstep. For a truly unique stay, book one of the underwater suites! Price: Starting from USD 478* per room per night. Located in a shady position amid the palms of a desert oasis, the Al Maha Desert Resort combines contemporary chic with Bedouin heritage and architecture to create accommodation like nowhere else. There is both a heated infinity pool and a sundeck from where you can watch the passing Arabian wildlife together. Location: 45 minutes from downtown Dubai in the Arabian desert. Price: Starting from USD 1200* per night. Although there is a mix of many cultures in Dubai, it remains a conservative Muslim country, and to respect local culture it’s important to dress modestly (away from the beach), with shoulders to knees covered. Loose fitting clothing with not only help you meet this requirement, but also keep you cool. It is not necessary for female visitors to cover their heads or wear hijabs. Likewise, although this is your honeymoon, displays of affection beyond hand-holding are not acceptable in public spaces. The drinking of alcohol is banned in public spaces. 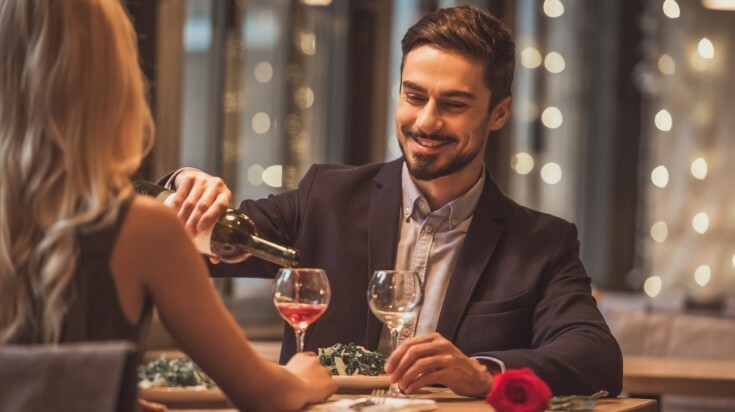 While licenses are required to purchase alcohol, you’ll have no such troubles when ordering a glass of wine or bottle of beer at your hotel or restaurant. Air-conditioned spaces can be cold, particularly after the warmth of outside, so you might want to bring a light long-sleeved top or similar. Dubai has spent millions on infrastructure, including a metro system, that can get you from the airport to the main tourist hotspots at very little cost. However, for shorter trips, you’ll want to use taxis instead, which are also very cheap and much more convenient. English is widely spoken in Dubai, so there’s no need for that Arabic phrasebook! Dubai is a fantastic honeymoon destination. 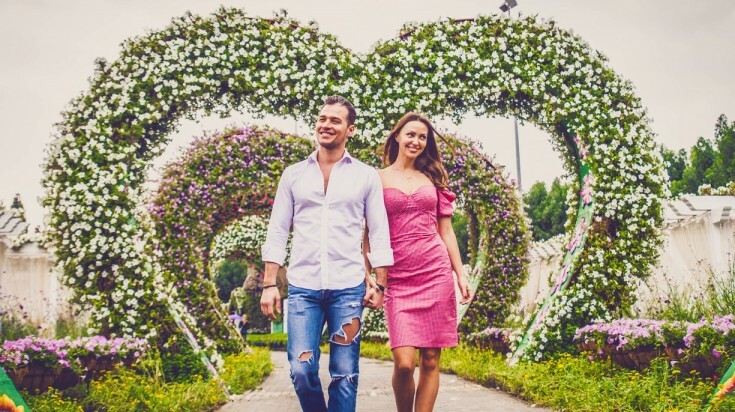 With some of the world’s finest hotels, incredible food, wonderful sights, and a whole host of activities, there’s no reason you can’t set your married life off with a bang with a Dubai honeymoon.